One America is a mutual insurance company which provides comprehensive insurance products for over 10 million people in the United States. One America was founded in 1877 and has been one of the leading insurers in the country for over 100 years. Policyholders in all 50 states, One America has 1,950 employees, assets of over $75 billion with over $2 billion in annual revenues. One America is currently headquartered in Indianapolis, Indiana in the One America Tower. OneAmerica Life is among the country’s largest providers of life, annuity, long term care and disability protection while offering its products to individuals and groups. One America manages billions worth in assets in in partnership with its investment house subsidiary. OneAmerica now offers two different ways to submit Asset Care cases. Asset Care “Ticket” (electronic and paper Tickets are available, but eTicket is strongly preferred). Asset Care “Application” (electronic and paper applications are available, but eApp is strongly preferred). When using the Ticket/eTicket process you are not required to ask your clients any medical questions. With the Application/eApp process you must ask detailed questions about their medical history, height/weight, medications, and doctor’s visits. Here is an overview of the two different submission processes and how they work. Asset Care Ticket/eTicket submission process. (Review the Asset Care Ineligible Impairments List - linked above - with your clients to make sure they are eligible to apply). Complete the Asset Care Ticket and other required forms – either on paper or electronically. Please refer to the attached checklist when submitting a paper Ticket. Electronic Tickets can be completed through iPipeline, OneAmerica SalesConnection, or via a link on the OneAmerica Online Benefits Calculator. iPipeline in footer - iPipeline Home - Submit LTC - Asset Based LTC Whole Life or Annuity. Schedule the phone interview by calling Lifeplans at 855-897-2815. Submit the Ticket to OneAmerica – by fax (317-285-5235) or electronically. Underwriting: Applicants complete the phone interview at the time scheduled. Ticket phone interviews take about 45 minutes per person. Clients should complete the Pre-Interview Worksheet prior to the interview taking place. Interview results are sent to OneAmerica and reviewed by an Underwriter. A decision is made to approve the applicants, decline them, or move the case to Traditional Underwriting. (Traditional Underwriting may include Medical Records, Exams, or both. Refer to the chart on page 11 of the Care Solutions Underwriting Guide - linked above - for more information about Traditional Underwriting Requirements. Note that the requirements can be changed at the discretion of the Underwriter. If a case has been moved to Traditional Underwriting, the Underwriter will review all requirements once they are received, and make a decision to approve the applicants, decline them, or approve with a Best Offer (Asset Care with a table rating or offer of Annuity Care). 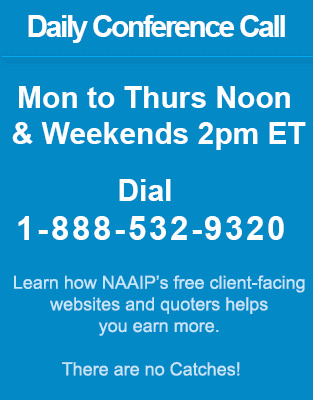 As always, feel free to reach out to NAAIP with any questions. Contact us for upcoming webinar on Setting up the LTC sale. Contact us for upcoming webinar on Covering two individuals under one policy. Contact us for upcoming webinar on Lifetime benefits and the advantages of Hybrid LTC. Contact us for upcoming webinar on Use of IRA, 401k, 403b to pay for LTC. Contact us for upcoming webinar on Guaranteed premiums for LTC. Contact us for upcoming webinar on Convert NQ annuities to tax-free for LTC. Contact us for upcoming webinar on Lifetime Benefits vs. Limited Duration Benefits. Contact us for upcoming webinar on Why Joint Life? Contact us for upcoming webinar on Legacy Care Uses. Contact us for upcoming webinar on Annuity Care. Contact us for upcoming webinar on OneSource Online Walkthrough. Contact us for upcoming webinar on Qualified Funding Options. Contact us for upcoming webinar on Claims Process & Concierge. Contact us for upcoming webinar on Great Retirement Income Group. Contact us for upcoming webinar on Asset-Care IV. One process for Care Solutions new business submission. Asset-Care and Annuity Care new business submissions will now utilize streamlined ticket applications. When agents fill out the ticket application, no health questions are required. In fact, the health questions are now grayed out on paper ticket applications to provide greater clarity. The appropriate ticket application should now be used for all Asset-Care and Annuity Care paper applications, instead of the previously introduced paper ticket (I-30837 or state variation). In electronic submissions, agents simply choose to follow the ticket application process and health questions will be suppressed. After completing the appropriate ticket application and reviewing the ineligible impairments listing with the client, the agent must then order and schedule the interview. Review our NEW tip sheet for more details on the ordering and interview process! Health question access via eApp. Need to ask health questions at the time of submission? To do so, your agents may submit an electronic application and choose not to follow the ticket application. The full medical application will still be available in the Submit LTC section of NAAIP's iPipeline. Faster payment with improved policy issue process.In order to get paid faster, agents will now submit premium prior to policy issue/delivery. Once the premium is received, new business will issue and pay the policy, which generates commissions. Collecting premium on policy delivery (i.e. COD) will be done by request only and can be indicated on a cover sheet or through your OneAmerica case manager. OneAmerica companies' Annuity Training Program This site provides you the opportunity to satisfy the training requirements necessary to sell OneAmerica companies’ individual annuity products in compliance with state regulation. Through this site we offer both annuity product specific training and access to a four credit hour general annuity training course (available at your expense). The companies of OneAmerica will verify that both programs are completed prior to accepting any annuity business. One America Life provides customers with a broad range of insurance products and services through One America Life and other affiliates. One America Life has enjoyed steady growth in terms of clientele and asset management over the last 130 years. Over 10 million Americans have been or are One America policyholders. One America Life is a long term care insurance specialist, having pioneered this market in the late 1960s. OneAmerica Life continues to provide its customers innovative LTCi products that are gaining market share on a consistent basis over the last decade. Financial institution services include life, disabity, annuity and long term care insurance products. One America is lauded by the major insurance ratings providers, including a Standard and Poor's rating of superior.